In Middle English, “bald” meant white-headed. Other names: American eagle, black eagle, fishing eagle, gray eagle, Washington eagle, white-headed sea eagle. Hunting habits: Feeds mostly on fish, either caught alive, stolen from Ospreys, or found dead, especially near dams and power plants. Takes many crippled ducks and geese during hunting season and winter. Also regularly scavenges on carrion. Migrating habits: Migrants can be seen throughout the fall, but peak flights occur very late in November and December. 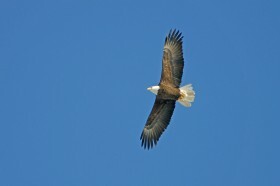 Most eagles wait till lakes freeze before heading south. Nesting habits: Usually built near the top of a supercanopy pine or hardwood. A pair returns to the same nesting territory year after year, usually to the same nest. Most nests stay the same size over many years. Life expectancy: One lived at the National Zoo over 30 years. One banded wild bird was shot in Mexico when 10 years, 5 months old. Another banded eagle survived 21 years, 11 months.